But still, we’re back at the top of the league thanks to a James Milner penalty with nine minutes to go after Ryan Babel levelled at 74 minutes to cancel out Sadio Mané’s first half finish for his 20th goal of the season. Klopp was obviously glad to see us take those three points away from Craven Cottage, but was aware that “we lost the rhythm a little bit” in the Fulham game. “It’s a strange one, it’s so different to the two games we played in the week, Burnley, Munich and now Fulham. They were three nearly different kind of sports”, he added. It’s true – beating Bayern on Wednesday gave us a lot of confidence going into this one, but also drained some of the stamina from the lads. Klopp: “They deserved a goal but we deserved three points. A brilliant afternoon I have to say. “The goal they scored, I thought a little bit we begged for it”, he admitted. “But then I actually saw the reaction of my players and I’m really pleased with that. It was a good reaction. After they got the equaliser, we were again much clearer than we were before the equaliser. 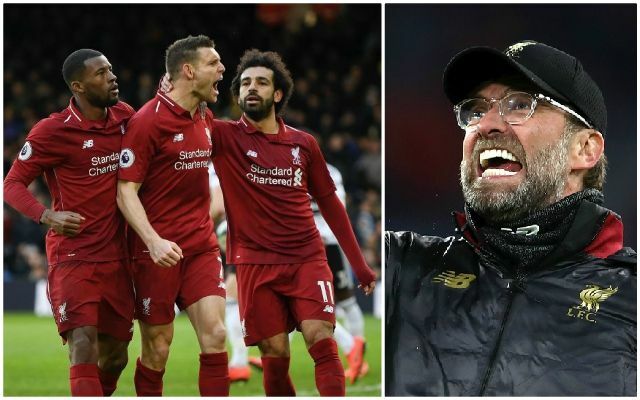 Klopp was also confident in the Reds he’d put out on the pitch: “I was sure we would not panic, we would not show the nerves you are all waiting for. We are long enough in this situation. “We controlled the game completely and then we gave Fulham the ball, the crowd came and it was a bit more exciting again. We had a very intense week, going to Munich and coming back, travelling to London is not around the corner for us. On our return to the summit of the table the German explained, “For us, it was clear – it is always clear – City don’t look like they’ll drop a lot of points, so we have to win and to win and to win. That’s our job to do…It is very important that we won today”, he added. It’s all still to play for and after the international break we’ll be hosting Tottenham at the end of March. We’ve just got to hope the boys stay safe with their national sides – no silly injuries please!